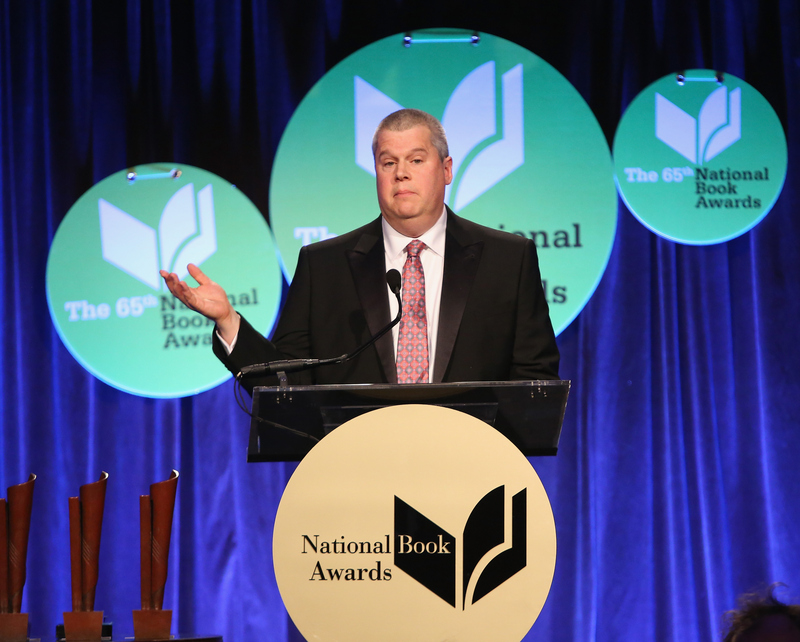 The National Book Awards are intended to be the Academy Awards for authors, but some are saying the event was marred by host Daniel Handler's racist jokes. Jacqueline Woodson, a favorite for the prize, took home the National Book Award for Young People's Literature for her novel Brown Girl Dreaming, a story about growing up as an African American girl in the 1960s told entirely in verse. Woodson made a heartfelt acceptance speech, touching on how much deep respect and love young adult writers have for each other. But immediately afterward is when it got extremely problematic. I told you — I told Jackie she was gonna win, and I, uh, said that if she won, I would tell all of you something I learned about her this summer. Which is that Jackie Woodson is allergic to watermelon. Just let that sink in your mind. And I said, you have to put that in a book. She said, YOU put it in a book. And I said, I'm only writing a book about a black girl that's allergic to watermelon if I get a blurb from you, Cornell West, Toni Morrison and Barack Obama saying "This guy's okay, this guy's fine." [Laughs] Alright, we'll talk about it later. Did he really just make a black women love watermelon joke? That "Alright, we'll talk about it later," was in response to the intensely terse and awkward laughter that followed, because the people in the audience and us watching at home were shocked. The way Handler set up the joke sounds like he and Woodson are friends, or at least friendly, and we know they are peers in the young adult literature industry, but neither of these things make that joke OK. When we live in a literary world that still needs hashtags and movements like #WeNeedDiverseBooks to give voice to characters like the ones Woodson has created, Woodson winning an award for Brown Girl Dreaming is a major deal. And to make a racist joke afterward is not only demeaning, it's an undercurrent of the issues in the publishing industry. But you guys, it got worse. Handler referred to the two black nominees in the poetry category as "probable cause." Yikes. You can argue it's satire, and it likely was its intention, but at the National Book Awards, which is a highlight for many authors' careers? Not just poor taste, but extremely disrespectful. And I'm not the only one who thinks so. Reactions bubbled up almost immediately on Twitter against Handler, and the voice is getting stronger. Handler himself has used Twitter to apologize for his statements. I'm glad he has owned up to his comments and has apologized, but we still all have a long way to go — this event has shown — for true respect and representation of all voices in literature. Books featuring people of color and written by people of color are still criminally underrepresented on bookshelves today, and let's hope that Woodson's win and the backlash against Handler's remarks can begin even more of a push to change those statistics.